12/21/2004 "WE'LL TAK' A CUP O' KINDNESS YET!" THIS IS A TIME OF YEAR WHEN MANY OF US ARE FORTUNATE ENOUGH TO LEAVE OUR DAILY WORRIES BEHIND FOR A LITTLE WHILE, WHEN WE GET TO BE WITH OUR LOVED ONES, WHEN WE GET THE LUXURY OF SPENDING ENTIRE DAYS AND NIGHTS WITH OUR FAMILIES AND FRIENDS. IT IS ALSO A TIME THAT ALLOWS US TO REFLECT ON OUR LIVES AND TO GET IN TOUCH WITH ALL THOSE WHO ARE DEAR TO OUR HEARTS. I'D LIKE TO TAKE THIS OPPORTUNITY TO THANK ALL OF YOU WHO TOUCHED MY HEART, AND THOSE OF MY BANDMATES THIS YEAR. BIG THANKS TO ALL OF YOU WHO HAVE WRITTEN OR HAVE COME TO ONE OF OUR CONCERTS. SPECIAL THANKS TO OUR GUEST FIDDLER "PADDY" BÜTLER, WHO WE HAD SUCH A GREAT TIME WITH IN PLAUEN! MY BIGGEST THANK YOU GOES OUT TO NO OTHER THAN OUR DEAR FRIEND AND LEAD GUITARIST MICHAEL SINN, WHO ONLY RECENTLY LEFT BEYOND THE FIELDS TO WALK A DIFFERENT PATH IN LIFE. THANK YOU VERY MUCH INDEED, AND MAY THE FUTURE BRING YOU ALL YOUR HEART DESIRES! IN KEEPING WITH THE TRADITION I STARTED LAST YEAR, HERE'S THIS YEAR'S CHRISTMAS PRESENT FROM BEYOND THE FIELDS. A 2004 REHEARSAL OUTTAKE OF THIS MORNING UP IN HEAVEN, FEATURING BOTH MICHAEL AND "PADDY". HOPE YOU ENJOY IT, FOLKS! 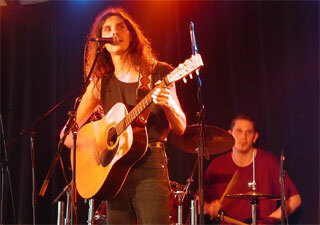 BEYOND THE FIELDS WILL BE BACK IN 2005, PRESENTING BOTH NEW TUNES AND A NEW LEAD GUITARIST. FOR THOSE WHO FANCY ACOUSTIC CONCERTS, DON'T FORGET TO JOIN US ON JANUARY 22ND AT THE LION IN BISCHOFSZELL. YOU'LL GET TO HEAR A LOT OF NEW STUFF THAT NIGHT! THE SHOW STARTS AT 20:30 PM. ADMISSION IS CHF 20. FOR RESERVATIONS, CALL (+41) 714228020, OR SEND A FAX TO (+41) 714228030. WELL, THAT'S IT FROM ME FOR 2004. AND A DOWNRIGHT FANTASTIC NEW YEAR! HEY THERE, JUST A QUICK NOTE TO BRING YOU UP TO DATE ON THE ROCK STAGE FESTIVAL. HAVING TURNED INTO A REAL-LIFE DRAMA, WITH FLOODS, DELAYED RECONSTRUCTION WORKS, FINDING A NEW DATE AND a new LOCATION, THE EVENT NOW TAKES PLACE ON SATURDAY, OCTOBER 16, AT THE SCHMITTEBAR IN LANGRICKENBACH. DOORS OPEN AT 18:00. THE FIRST BAND KICKS OFF AT 19:00. BEYOND THE FIELDS SHOULD HIT THE STAGE AROUND 23:00. SOME OF OUR BAND MEMBERS WILL BE THERE ALL EVENING, BY THE WAY. SO IF YOU FEEL LIKE JOINING US FOR A CUP OF COFFEE BEFORE THE SHOW . . .
ON A DIFFERENT NOTE, I JUST ADDED ANOTHER BUNCH OF NEW PICTURES AND LYRICS TO OUR SITE, AS WELL AS A NEW BAND BIOGRAPHY FROM A RECENT NEWSPAPER ARTICLE. THE MALZHAUS OPEN AIR SHOULD DEFINITELY BE WORTH CHECKING OUT. TAKES PLACE RIGHT IN THE HEART OF THE HISTORICAL CITY OF PLAUEN IN SAXONY! HEADLINING THE EVENT WILL BE FIDDLER'S GREEN, A FINE AND QUITE POPULAR FOLK ROCK BAND FROM GERMANY, MIXING TRADITIONAL IRISH MUSIC WITH SKA, PUNK AND WHAT NOT. TO FIND OUT MORE ABOUT THE FIDDLERS OR THE MALZHAUS OPEN AIR, TRY WWW.FIDDLERS.DE OR WWW.MALZHAUS.DE. THE ROCK STAGE FESTIVAL ON OCTOBER 16 IS AN INDOOR EVENT WITH BEYOND THE FIELDS HEADLINING. MORE INFORMATION ON THAT ONE CAN BE FOUND HERE. 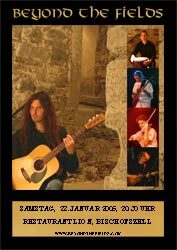 FOR THOSE WHO FAVOUR OUR "ACOUSTIC" SHOWS, MAKE SURE TO JOIN US ON JANUARY 22, 2005, WHEN WE RETURN TO THE FABULOUS CELLAR BAR AT THE LION IN BISCHOFSZELL. I DON'T WANNA GIVE TOO MUCH AWAY, BUT IT'S GONNA BE A VERY SPECIAL NIGHT, WITH A VERY SPECIAL LINE-UP! SO BE THERE . . . AND BE THERE EARLY, AS WE EXPECT TO HAVE A FULL HOUSE AGAIN. FOR THOSE WHO HAVE ASKED ME ABOUT NEW RECORDINGS AND WHETHER THERE ARE ANY PLANS FOR A NEW CD. YES, WE ARE PLANNING ON MAKING SOME PROPER RECORDINGS WITH THE NEW LINE-UP THIS FALL OR WINTER. AND YES, I AM CONSIDERING THE POSSIBILITY OF A NEW CD RELEASE. BUT THAT'S ABOUT ALL I CAN TELL YOU RIGHT NOW. TO OFFER YOU SOME NEW MUSIC AFTER ALL, I JUST ADDED TWO LITERALLY BRAND-NEW REHEARSAL OUTTAKES TO OUR SOUNDS PAGE! HOPE YOU LIKE THE TUNES. AND IF YOU DO, LET US KNOW! GUESS THAT'S ALL FOR TODAY . . .
06/22/2004 NEW DATE FOR THE CONCERT SPECIAL! WE’VE JUST BEEN INFORMED THAT THE BTF SPECIAL ON TOXIC.FM WILL BE AIRED TWO WEEKS LATER. THAT’S ON TUESDAY, JULY 6TH. FOR MORE INFORMATION ON WHEN AND WHERE YOU CAN CATCH THE PROGRAMME, PLEASE SEE MY POST FROM 06/12/2004. SORRY ABOUT THE DELAY! WELL I GUESS "ANY TIME IS ALRIGHT", HUH? ALTHOUGH SOME MUSICIANS MIGHT ARGUE THAT MUCH DELAY IS NEVER A GOOD THING . . .
PICTURES FROM THE CONCERT CAN BE FOUND HERE. YOU MIGHT ALSO LIKE TO HEAR THAT WE FINALLY HAVE A NEW GUESTBOOK FOR YOU. PLEASE USE IT OFTEN AND FREELY. WE ALWAYS LOVE TO HEAR FROM YOU . . .
05/24/2004 "YOU AIN'T SEEN NOTHIN' YET!" HEY FOLKS, WHAT'S UP? QUITE SOME TIME SINCE YOU LAST HEARD FROM US, HUH? NOT THAT WE'VE BEEN LAZY OR ANYTHING. NO WAY! MARTIN DID LOTS OF CLASSICAL CONCERTS. MARCEL DID CD PRODUCTIONS FOR OTHER BANDS. AND I WROTE AND RECORDED YET ANOTHER BUNCH OF NEW TUNES FOR BEYOND THE FIELDS. I'VE ACTUALLY PILED UP SO MUCH UNRELEASED STUFF BY NOW THAT WE COULD PUT OUT A NEW ALBUM EVERY YEAR WITHOUT HAVING TO WRITE A SINGLE NEW SONG FOR AGES! BUT THAT'S GOOD. ALWAYS NICE TO HAVE A LARGE REPERTOIRE TO CHOOSE FROM. YET MUCH MORE HAPPENED WITH BEYOND THE FIELDS SINCE I LAST WROTE YOU. ON THE BAD SIDE, I'M SAD TO SAY THAT ONLY SHORTLY AFTER OUR MANDOLIN PLAYER'S DEPARTURE, OUR GOOD FRIEND AND FIDDLER MAXIMILIAN LEFT US AS WELL. EASILY BEING ONE THE BUSIEST MEN I KNOW, HE JUST FOUND IT MORE AND MORE DIFFICULT TO FIND ENOUGH TIME FOR THE BAND. ONLY OUR BIGGEST THANKS AND VERY BEST WISHES GO OUT TO HIM AND HIS FAMILY. ON THE GOOD SIDE, I'M MORE THAN HAPPY TO SAY THAT WE ALREADY HAVE A NEW FIDDLER AND A NEW MANDOLIN PLAYER IN THE BAND! THAT'S RIGHT! 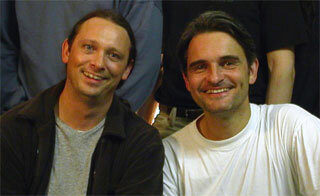 MEET JÖRG WALESCH AND GÜNTHER HAHN. TWO VERY FINE MUSICIANS INDEED. JÖRG IS A VIOLIN PLAYER AND TEACHER LIVING IN THE LAKE CONSTANCE AREA. HE HAS TWO CDS WITH AMERICAN SINGER/SONGWRITER CLYDE BAILEY TO HIS CREDIT. GÜNTHER IS A LONG-TIME MEMBER OF THE FOLK BAND JIGSAW, LIVES IN THE CITY OF CONSTANCE AND IS PART OF THE TRADITIONAL IRISH FOLK SCENE THERE. I'M REALLY EXCITED TO HAVE JÖRG AND GÜNTHER IN THE BAND AND I CAN HARDLY WAIT TO PRESENT THEM TO YOU LIVE. IN FACT, YOU ALL CAN SEE AND HEAR THEM LIVE PRETTY SOON, IF YOU LIKE. THE NEW LINE-UP PREMIERES AT THE "MUSIG UF DÄ GASS" FESTIVAL IN ST. GALLEN, ON THURSDAY, JUNE 10TH, 7 PM. WE PLAY AT THE WAAGHAUS. ENTRANCE IS FREE. WHAT A WAY TO SPEND ONE'S BIRTHDAY, HUH? FREQUENT VISITORS TO OUR WEBSITE MAY HAVE NOTICED THAT ALTHOUGH I HAVEN'T POSTED ANYTHING ON THE NEWS PAGE FOR QUITE A WHILE, I'VE NEVERTHELESS ADDED AN AWFUL LOT TO OTHER PAGES. RECENT ADDITIONS INCLUDE MORE OUTTAKES FROM LAST YEAR'S DEMO SESSIONS, 4-TRACK RECORDINGS OF NEW TUNES "GHOSTS" AND "WHITE THUNDER", LINKS TO THINGS BEYOND THE FIELDS ON OTHER PEOPLE'S SITES, INCLUDING A LONG INTERVIEW WITH ME ON A SPANISH MUSIC WEBSITE, LOTS OF NEW LYRICS AND SONG NOTES . . . AND EVEN A SHORT STORY! AS TO A NEW GUESTBOOK, I HOPE TO HAVE ONE UP AND RUNNING IN THE NEXT COUPLE OF DAYS. SO STAY TUNED . . .